The government has clearly expressed its willingness to reinvest in the security of our country, the people and the military. The armed forces will receive the necessary equipment to carry out its operations. Minister of Defense Steven Vandeput has, for this reason, obtained parliamentary approval for a military planning law providing for investments in modern and efficient defense equipment up worth up to 9.2 billion euros. Steven Vandeput said "Nearly 80%, more than 7 billion investments of the Strategic Vision [multiyear plan], have now been started or have already been completed. Never before has a government invested so much in our security. One of the most important investments in the Strategic Vision is the replacement of our air combat capability. Expenditure will amount to 4.011 billion euros, or half a billion euros less than earmarked in the Strategic Vision. For this amount, our country will obtain 34 F-35A, two flight simulation centers, equipment and ICT systems for operational and technical support of the aircraft on base and during their deployments, as well as high technology helmet systems for pilots. This level of investment covers, among other things, the costs of upgrading the weapon system and the recycling of pilots and technical personnel for the period 2018-2030. The first new fighter jets are expected by 2023. 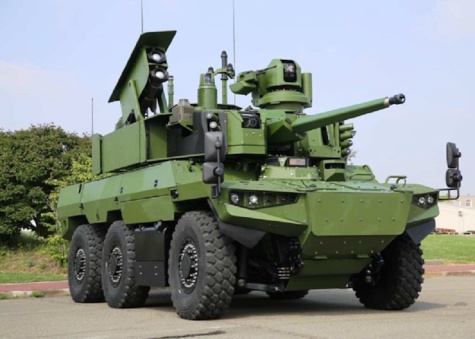 The Council of Ministers also today approved the proposal of the Minister of Defense, Steven Vandeput, to award the purchase of new combat vehicles to France for the benefit of the Belgian Land Component. The new combat vehicles are developed as part of the French Scorpion program and will replace the current Piranha and Dingo combat vehicles. Sixty Jaguar-type medium combat vehicles and 382 Griffon light combat vehicles will be purchased, including communications and spare parts. This acquisition, in line with the principles of the Strategic Vision, goes hand in hand with a revolution in defense cooperation for our Land Component. A partnership with France is set up based on identical French and Belgian combat vehicles. The aim of this partnership is that Belgium and France will have, among other things, a common organization and that training, training and logistical support will be organized jointly. The entry into service of the vehicles is planned in the period 2025-2030. In the short term, it is already planned to start the close partnership with France. The government has agreed to negotiate with the United States for the purchase of two MALE drone systems. MALE means Average Altitude Long Endurance. These are reconnaissance drones that collect information from the sky. Steven Vandeput said "MALE drones play an increasingly important role in operations, but at the European level, there is a shortage of this type of drones. With this purchase, Defense is committed to the future while filling a capacity deficit at the European level. Using MALE drones and keeping them operational is a complex undertaking. One of the conditions of this purchase was that our country would be able to partner with another country." Cooperation with a partner country guarantees economies of scale in terms of equipment, maintenance, training and operations. Since MALE drones will be mainly engaged in EU and NATO operations, a partnership will be sought with an EU or NATO member country. With these decisions, the government shows that it believes in a strong Belgian Defense and wishes to continue to invest in it. In the spirit of the Strategic Vision, it gives the department the means to properly carry out its missions in the short and long term. (EDITOR’S NOTE: According to an Oct 24 briefing to the Belgian Parliament’s defense and finance committee’s, the first two SkyGuardian systems, each comprising two aircraft and a ground control station, will be delivered in 2021 and 2022. Each system will cost €180 million. Two further systems are to be procured later, so that a total of four systems, with eight aircraft, are in service by 2030. The price mentioned above for the F-35 differs from the €4.658 billion quoted during the same Oct 24 briefing by Col. Harold Van Pee, head of Air force procurement and of the Air Combat Capability Program (ACCaP), and from the €2.594 billion he quoted later, after the briefing went into closed session.